For Windows XP, Vista, Windows 7, Windows 8, Windows 8.1 and Windows 10. E-Paint — the Windows paint application that's easy to use, quick to learn and less difficult to master than many brands of soap. If you're able to work the web browser that's displaying this document, you have all the necessary skills to successfully operate e-Paint. E-Paint embodies a rich selection of popular drawing and image-editing tools without attempting to squeeze every imaginable painting function in there somewhere, just so it can say it has them. It provides robust painting functionality, but it won't burden you with innumerable features to click through. It has a very short learning curve. E-Paint's features include a variety of selection tools; antialiased drawing and text; a gallery of image processing filters ranging from tastefully subtle to breathtakingly wild; multiple document handling, soft brushes, local undo, variable magnification and an intuitive user interface — you might not even need its extensive, accessible documentation and tutorials. You'll find e-Paint to be the perfect tool for fine-tuning your digital photographs; drawing cells for web page animations; creating original artwork; building graphics for business presentations or, if you're employed by one of the supermarket tabloids, gluing the head of the president of the United States onto the body of an extraterrestrial. It has few limits, and in the latter example, very little shame. This software is available for electronic delivery and on DVD-ROM. 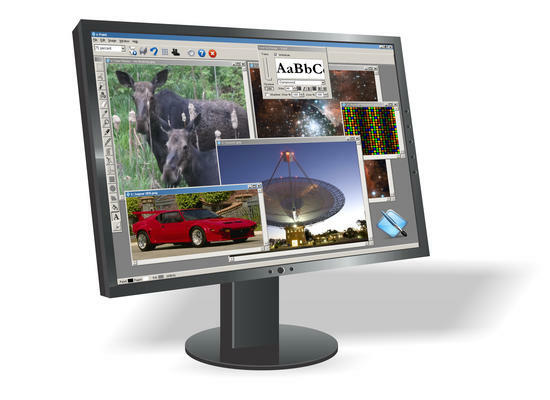 Create and edit graphics stored as BMP, PCX, TGA, JPG, GIF and PNG files. Draw with antialiasing to create smooth, professional lines, shapes and text. Soften, sharpen, color-adjust and manipulate your graphics with a rich library of image processing filters. Repair minor imperfections in your digital photographs. Make radical alternations to your pictures. One nose is never enough. Work quickly — the intuitive user interface of e-Paint will keep your mouse from melting down. Get up to speed with e-Paint's extensive documentation and tutorials. If you're uncertain whether you need e-Paint or our Alpha Paint alpha-channel image editing and drawing application, check out this comparison between them. IMPORTANT: e-Paint requires access to the Internet to validate itself after installation. Please see the discussion of registration key security for a detailed discussion of this functionality. You can ensure yourself of a problem-free installation by reviewing our downloading and installation instructions. Downloadable installers can be used to install either an evaluation copy or a fully-functional registered copy of Alchemy Mindworks' applications. Important: You might see a warning during download or installation of these installers concerning possible "malicious code." These messages are generated by Windows if you attempt to download and install most non-Microsoft software. They can be safely ignored. Norton Antivirus: If you're running Norton Antivirus, please read the WS.Reputation notice before you download an installer from this page. Internet Explorer and Edge: If you're using Internet Explorer or Edge as your web browser, please read the Smart Screen notice before you download an installer from this page. Downloading: Note that you'll probably need to actually click on one of the following DOWNLOAD buttons to download an installer, rather than copying and pasting its link, or using it with a third-party download manager. The last DOWNLOAD button — DOWNLOAD 2 or DOWNLOAD 3, depending on where you're located — points to our server in Great Britain. If you're outside North America — or if you're encountering issues downloading from our primary servers — please try the one in the UK. If you encounter a problem downloading one of our installers, we're here to help — please contact us and let us know what happened. Installing: Be sure you're logged into your system as a normal user, not as Administrator, when you install and subsequently run this software. Click on one of the following links to download e-Paint 9.0a revision 2. This file is 29,902,848 bytes in length. Alchemy Mindworks' applications won't install spyware, malware or other invasions of your privacy, and we're extremely careful about virus scans. Learn more about the security of our downloaded installers. As of this writing, if you have previously registered or upgraded to e-Paint 8, we invite you to upgrade to e-Paint 9 for half price. We are able to provide some limited support for the version 8 software, but it's becoming increasingly vulnerable to changes in Windows and some third-party security products. e-Paint 4, 5, 6 and 7 have reached their ends-of-life, and they have been removed from distribution. We no longer have replacement installers for these products. We are able to provide replacement registration keys and limited support for e-Paint 7. We recommend that you register e-Paint 9.
e-Paint 2 has reached its end-of-life, and it has been removed from distribution. We no longer have replacement registration keys or installers for this product, and support for it has ended. We recommend that you register e-Paint 9.
e-Paint™ is a trademark of Alchemy Mindworks Corporation. The title graphic at this page, Girl with Tattoos, is by Sarah Wissink, and is used under license from freeimages.com. The monitor graphic is used under license from DryIcons.